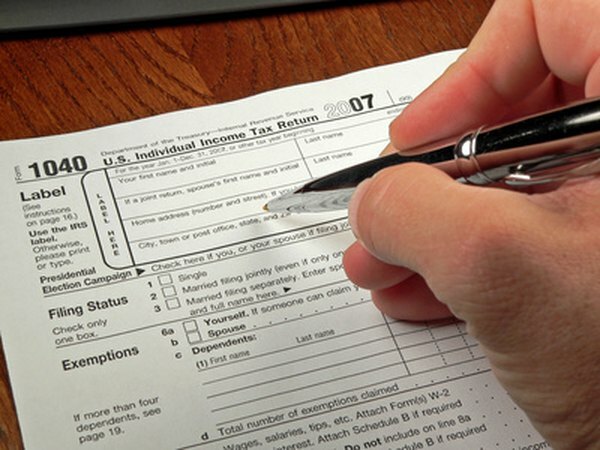 You must use Form 1040 or 1040A to report traditional IRA distributions. Traditional individual retirement arrangements, or IRAs, generally let you claim a tax deduction equal to the amount you put in. However, the tax breaks don't last forever. When you take a distribution, you're going to have to report it on your income taxes. Knowing the tax implications of distributions helps you time your distributions to lower your taxes. Since you receive a tax deduction for your traditional IRA contributions, you have to pay the Internal Revenue Service when you take your distributions. Most distributions from traditional IRAs are included in your taxable income and taxed as any other income, such as wages or salary, on your income tax return. For example, if you fall in the 25 percent tax bracket, you'll pay a 25 percent tax rate on your traditional IRA distribution. If you've made nondeductible contributions to your traditional IRAs, calculating the tax liability on your distribution becomes more complicated because the nondeductible contributions come out tax-free. You must pro-rate the distribution between the your nondeductible contributions and the rest of the money in the traditional IRA, based on the account composition. For example, assume you have $15,000 of nondeductible contributions and a total traditional IRA value of $60,000. Since 25 percent of your account comes from nondeductible contributions, 25 percent of your distribution is tax-free. If you take money out of a traditional IRA before you reach age 59-1/2, your distribution is a non-qualified, or early, distribution. For early distributions, the taxable portion of the distribution is subject to a 10 percent additional tax penalty unless an exception applies. For example, if you take a $16,000 traditional IRA distribution and the entire amount is taxable, not only do you owe income taxes, but you'll also pay a $1,600 additional tax penalty. In limited circumstances, you can avoid paying the 10 percent additional tax on early distributions, but you must meet the criteria of one of the exceptions. If you're permanently disabled or you inherited the IRA, you can take out as much as you want and the entire amount is exempt from the penalty. Other exceptions limit the amount of the exemption to the amount used for specific expenses. For example, you don't have to pay the penalty on amounts used to pay for your medical insurance premiums if you're unemployed, to pay for higher education costs or to use up to $10,000 to pay for a first home.